On the evening of April 21, mere hours after Prince’s passing, Columbia, South Carolina newspaper The State published an article detailing his legacy in the city. His longtime drummer, John Blackwell, grew up in Columbia. In 2011 this connection led to Prince donating $250,000 to local children’s charity Eau Clair Promise Zone shortly after playing a show in the city. Activities at Spirit Communications Park to honor Prince will include a pregame Prince tribute band, Prince music throughout the night and a pancake-eating contest. After the game, there will be a purple-themed fireworks display. Any fans driving little red Corvettes will receive free parking in the permitted parking lots adjacent to Spirit Communications Park. All fans born in 1999 will receive a free purple glow necklace at Guest Services with proper proof of age. For the lovebirds in the crowd, we’ll have a special Prince edition of the Northpoint Heating and Air Kiss Cam, featuring fans wearing purple shirts, blouses with ruffles or raspberry berets. We will also host a Ping Pong Tournament … with the winner receiving a CD of Prince’s Greatest Hits. In addition, frozen “Purple Rain” adult beverages will be on the bar menu. Not to nitpick, but wouldn’t a “frozen ‘Purple Rain'” beverage more accurately be known as “Purple Ice”? Nevermind, here’s another image of the jerseys. 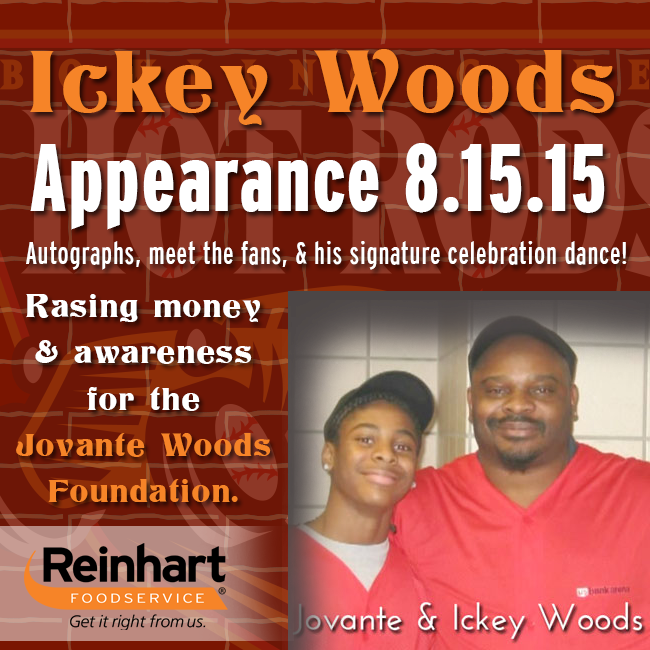 Proceeds from a jersey auction will benefit the Palmetto Place Children’s Shelter. 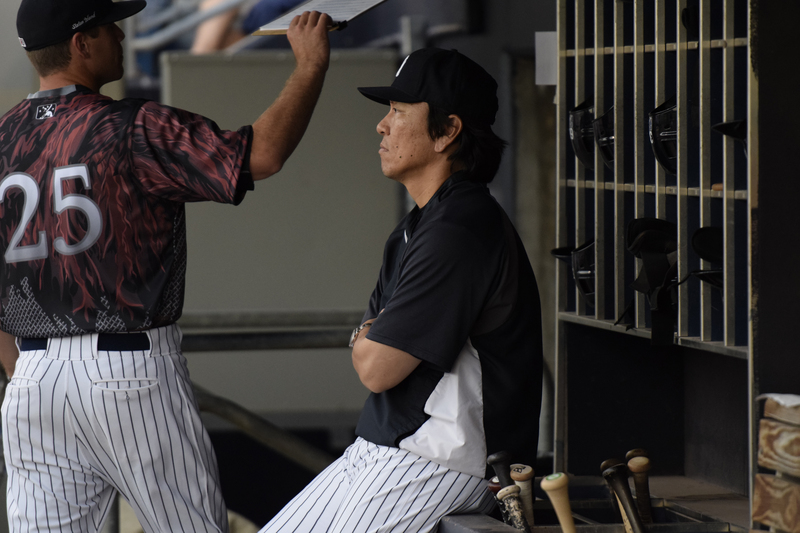 If you would like to know more about the Fireflies and their new home of Spirit Communications Park, then please check out my article recapping my visit there earlier this month. It’s a nice place to see a ballgame. This word, spoken from outside the door, is my alarm clock when I’m on the road. It brings me back to hotel room reality, as I lie in bed and wish to the high heavens that I had remembered to put up a “Do Not Disturb” sign the night before. Are you familiar with “The Show Before the Show”? It’s the weekly MiLB.com podcast, co-hosted by esteemed colleagues Sam “Not Lenny’s son” Dykstra and Tyler “Maybe Lenny’s son for all I know” Maun. 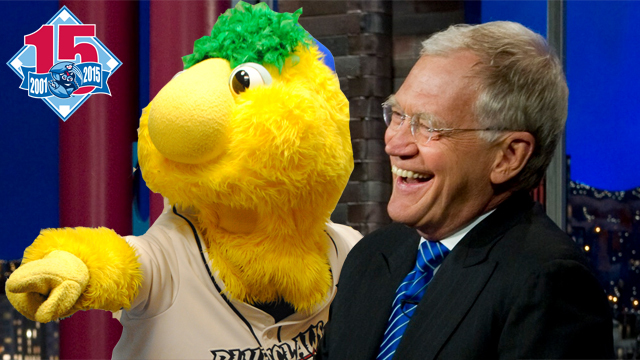 Each week, I join Tyler and Sam for “Ben’s Biz Banter,” in which we riff on current MiLB events that fall within my broad purview. Listen, rate and review HERE. But THAT IS NOT ALL. I’ve been promoting it relentlessly on Twitter, but earlier this month, Tyler and I hosted a special “ALL MINOR LEAGUE TEAM THEME SONGS” edition of the podcast. Seventeen baseball earworms, three interviews with songwriting masterminds and all the contextualizing info and theoretically witty banter you could could ever want. Look — like Richard Marx, it’s right here waiting for you! Listen now! I won’t give up until I’m satisfied. After listening to all of these songs way too many times, I think my favorite is “Everybody Loves Curve Baseball.” What’s yours? Also, if you’d like a specific team theme song to be featured in an upcoming episode, please get in touch. Every Friday, I have a feature story on MiLB.com. Today’s piece tracks a remarkable 36-season streak, as at least one new Minor League ballpark has opened every season from 1981-2016. Check it out HERE. And, hey, here’s a visual that shows how much the Minor League landscape has changed over the last two-plus decades. I had to compile and contextualize a lot of info for this piece and, unfortunately, there were a few omissions. I appreciate people pointing them out, but jeez, it’s not intentional. If I ever make a mistake regarding your team, it’s not because I don’t like your team. I love everyone. Meanwhile, earlier this month, I wrote a piece about David LaBounty and his “Bookstores and Baseball” zine. I was very glad to get the chance to write about a zine in a professional context, and this one fit as it is about, yes, bookstores and baseball. For years, David and his family have gone on road trips centered around attending literary festivals, visiting independent bookstores and seeing baseball games (many in the Minors). Each issue — or inning — of the zine covers a year of travel, and there are eight so far. If this sounds like your kind of thing, in line with your sensibilities, then give the article a read and check out the zine HERE. 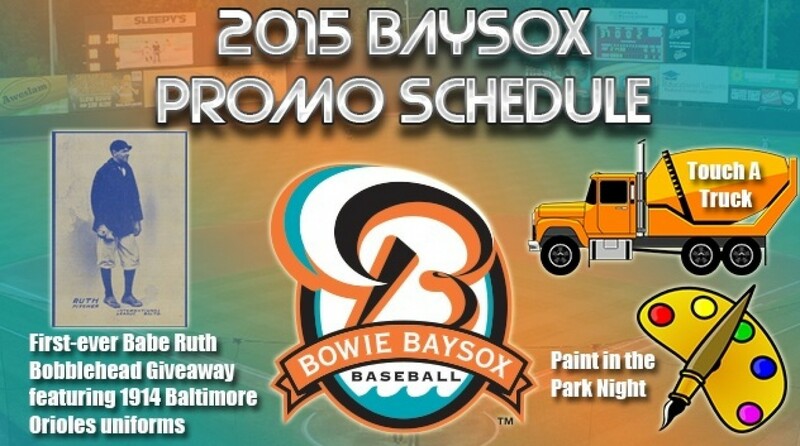 Also, if you like being kept abreast of the Minor League promo scene, check out “Promo Watch.” It runs every Tuesday. Where else can you find important information such as how Greg “The Hammer” Valentine bailed out of a Fort Myers Miracle appearance due to “unspecified differences” with fellow guest (and former tag team partner) Brutus “The Barber” Beefcake? Don’t worry. Bushwhacker Luke showed up in Greg’s place and all was well. And, of course, there’ll be plenty of road trip material — on MiLB.com and on the blog — in the very near future. I’ll be hitting the road next week! Okay, I shall now consider this house to be kept. Thanks, as always for reading. The Lehigh Valley IronPigs love food, and the Lehigh Valley IronPigs love Philadelphia. So what do you get when you combine the two? No, not a Liberty Bell replica made of bacon or a William Penn statue carved out of ham. You get this: A “Salute to Philadelphia” promotion in which the Triple-A Phillies affiliate will change its name to the “Cheesesteaks.” Finally, the northeast has it’s own version of “Fresno Tacos.” It happens on June 10. “There is much consternation over the proper way to eat these sandwiches — either ‘wit’ or ‘witout’ onions….Fans are encouraged to pick a side by using #TeamWit or #TeamWitout on social media, LVCheesesteaks.com or through the Uber app to decide whether the “Wit” or the “Witout” cap is worn on-field for “Salute to Philadelphia Night” on June 10. Speaking as someone who grew up in the Philly area — Ambler! — I’d say that there is “much consternation” regarding just about everything cheesesteak-related. And come to think of it, there is much consternation regarding just about every topic in Philly. Philly is the consternation capital of the country. If Landes needs more cheesesteak puns, I won’t stand Pat or say I can’t take Geno more. I’ll provolone him a few, gra-cheese, as they’re Amoroso funny and, of course, display ample “wit.” Stop me, I’m on a roll! Other “things Philadelphia” that the IronPigs plan on celebrating during their “Salute to Philly Night” include a Phillie Phanatic appearance and, uh, “post game Friday Night Fireworks presented by Brown Daub Kia.” I’m holding out for a pregame concert by a Hooters cover band, a Buddy Ryan lookalike contest and a roundtable discussion on the lasting cultural impact of WMMR’s “Morning Zoo.” I’d also suggest gauging the popularity of the city’s sports radio landscape by starting a #WIP or #WIPout social media contest. But, look, it all comes down to visuals in this biz and, thus, it all comes down to cheesesteaks. Here’s two more photos, and then I’m outta here. Of course, it is now time to defer to the press release. The uniforms feature the text “Riders” inside of the Game Boy “screen” on the front of the uniform top, above of a directional pad, “A,” “B,” “Select,” and “Start” buttons along with the classic Game Boy vent-style speaker on the lower right-hand side. On the back of the uniform, each player’s number will be represented with 8-bit digits and their name written on the top of an inserted “game cartridge.” The team will feature retro arcade games inside the ballpark and will be giving away both a next-gen and a retro gaming console that night. The fun continues as the Riders will be recreating classic video games as in-between innings contests. Recreating classic video games as between-inning contests? I saw the Hudson Valley Renegades do that once. 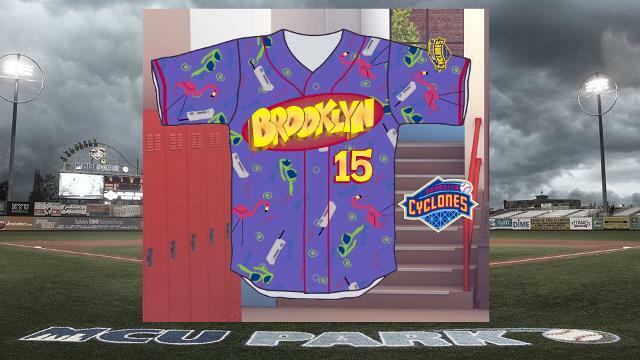 July 29th is Ghostbusters Night. Ernie “Winston Zeddemore” Hudson will be on hand at Dr Pepper Ballpark for the festivities, as will the Ecto-1 automobile. Fans will have the slime of their lives. June 24th is “Salute to Top Gun Night”, celebrating the 30th anniversary of — you guessed it — the movie Top Gun. The players will be introduced by their flight call signs as they come up the plate. Fans can participate in a “Lost that Loving Feeling” singing contest, and the first 30 fans that come dressed in the official Top Gun beach volleyball outfit (swimsuit and dog tags) can participate in sand volleyball match at the ballpark during the game on a genuine sand court! 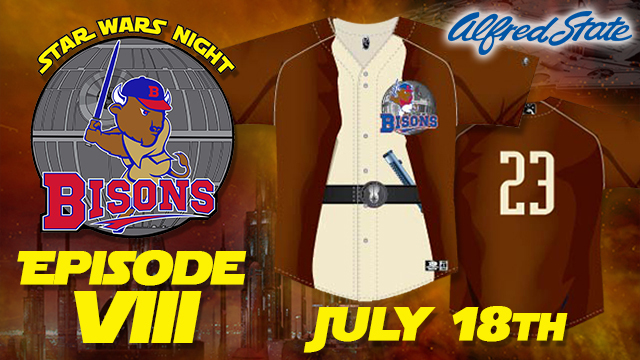 Finally, Star Wars Night is August 20. While the RoughRiders have not yet released their jerseys it is worth noting that fans in the Lazy River will float that night on Star Wars rafts. This may be one of them. As you may have already guessed (or read elsewhere, if I am somehow not your only source for Minor League Baseball news), this promo is in direct response to Sunday night’s Miss Universe debacle. Oh, man. Every one was “Phillipian” out about this. Mistakes happen. I really don’t think Steve Harvey deserves the internet-fueled scorn that has been heaped upon him, but at the same time this is an all-time classic pop culture moment. It was inevitable that a Minor League team would respond, and kudos to the RoughRiders for being the first team to celebrate second-place. The RoughRiders plan to formally invite Ariadna Gutiérrez Arevalo, “Miss Colombia,” as a VIP guest for the night. Gutiérrez will enjoy a suite for the night and an opportunity to throw out the first pitch. The RoughRiders are also inviting Steve Harvey to serve as the on-field host for the evening. With the night celebrating famous second-place finishes, the Riders have also extended an invitation to Jim Kelly, Andre Reed, and Marv Levy the quarterback, a wide receiver, and the coach of the Buffalo Bills during their four-year stretch of runner-up finishes in the Super Bowl (1991-1994). The team will celebrate other second-place finishers including Britney Spears and Christina Aguilera (runner-up on Star Search); Adam Lambert and Clay Aiken (American Idol); Carrie Underwood and Michelle Obama (high school salutatorian); Al Gore and Mitt Romney (presidential elections); and Cowboys running back Darren McFadden (two-time Heisman Trophy runner-up). During the game, RoughRiders players will be displayed on the video board with a sash, announcing each American player as “Mr. Texas” or whatever state they are from and international players honored with the name of their home country. 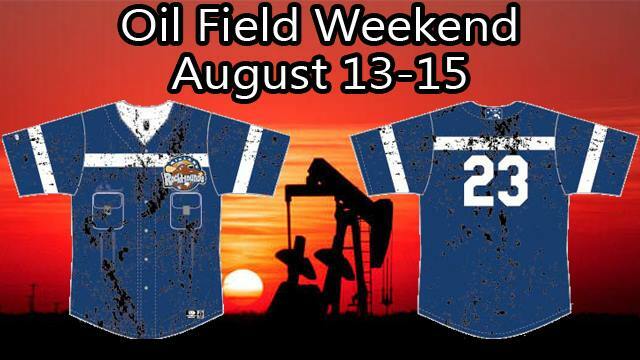 The RoughRiders plan to host an in-park beauty pageant throughout the game. 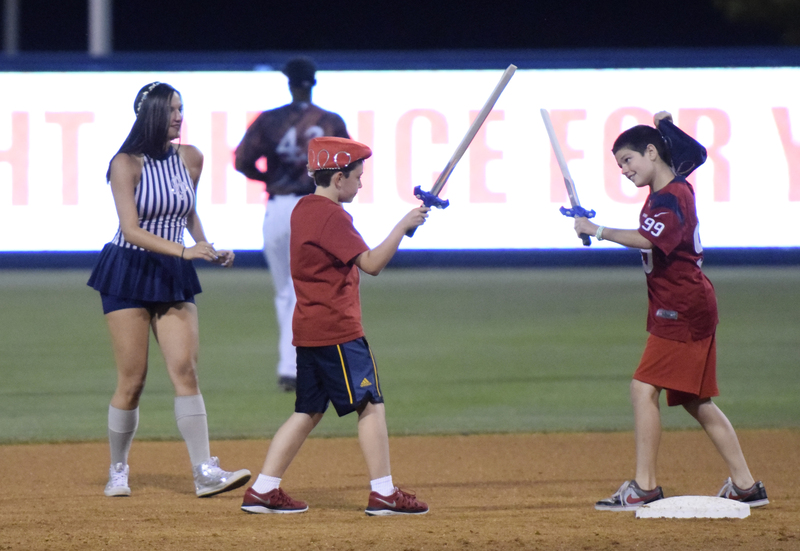 Any fan that can prove a second-place finish in a beauty contest or pageant at any level will receive a free ticket to the game between the RoughRiders and the San Antonio Missions. If I had had to guess which team would have been the first to announce such a promotion, I would have gone with the Myrtle Beach Pelicans. They have experience with this sort of thing. But, fittingly, my second guess would have been the Frisco RoughRiders. They share an ownership group with the Pelicans, as well as staff members (Hi, Nathan Barnett) who cut their promo brainstorming teeth while working in Myrtle Beach. And it’s certainly no surprise that, via Twitter, Pelicans prez Andy Milovich offered a suggestion regarding another “Runner-Up” that the Pelicans could honor. And since I can do anyone’s job better than they can do it, I have a few suggestions of my own. Maybe the RoughRiders could honor Teddy Roosevelt — the inspiration for their team name and logo –and his second-place showing in the 1912 presidential election. Or how about the 1986 Boston Red Sox, who were congratulated thusly on the Shea Stadium scoreboard? And who can forget this gubernatorial mishap, from the 2015 ALDS series between Houston and Kansas City? 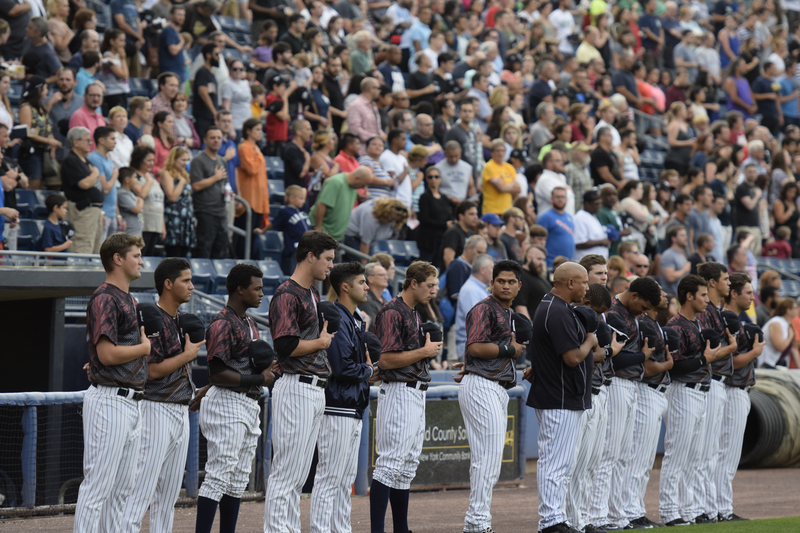 I’ve got plenty more “On the Road” content to share over the coming weeks, but today I wanted to take a brief break from all of that and head to the Staten Island Yankees’ home of Richmond County Bank Ballpark. 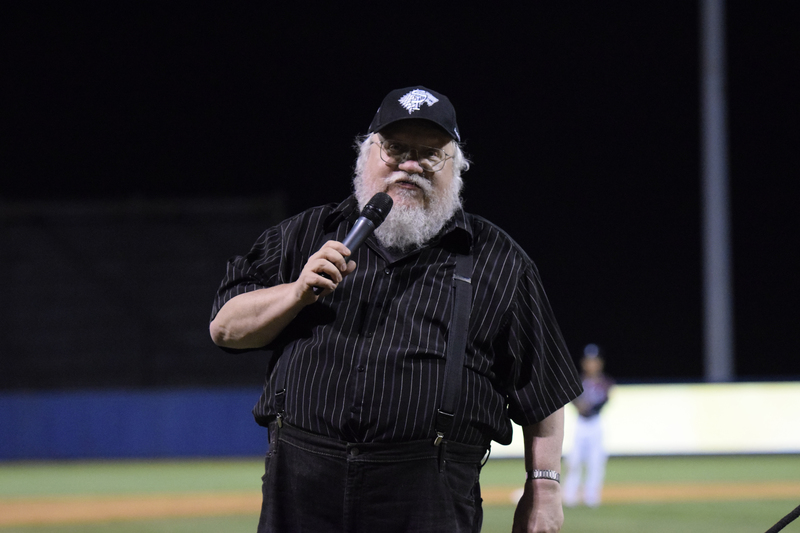 On Saturday, the team staged “Game of Thrones Night” and Robert Pimpsner of Pinstriped Prospects was kind enough to send along a plethora of photos from the evening. 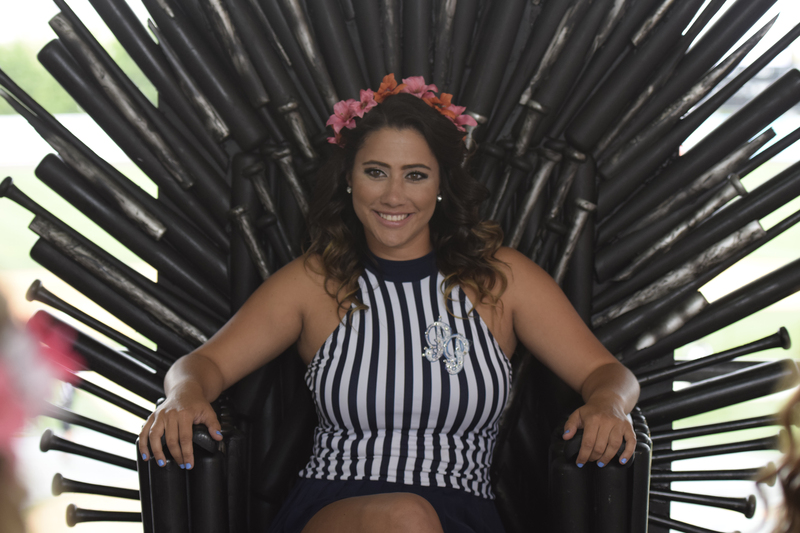 “Game of Thrones Night” turned out to be the most successful promotion in the history of the franchise, drawing a record crowd of 7.529 to the ballpark. The team, often referred to as the “Baby Bombers”, instead suited up as the “Direwolves”. And the creator himself, George R.R. Martin, was on hand as a special guest. 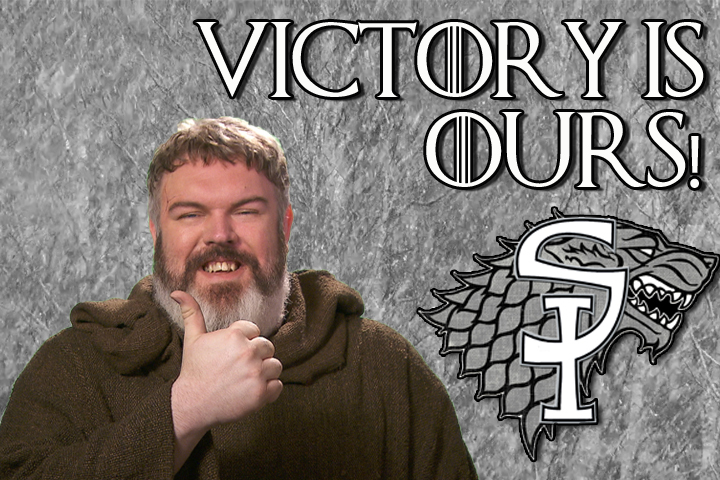 I’ve never seen Game of Thrones, so forgive me that this post won’t be peppered with clever references to the show. It will be peppered with lots of photos, however, because on the internet photos > words. And Pimpsner more than picks up the slack with his photo captions. 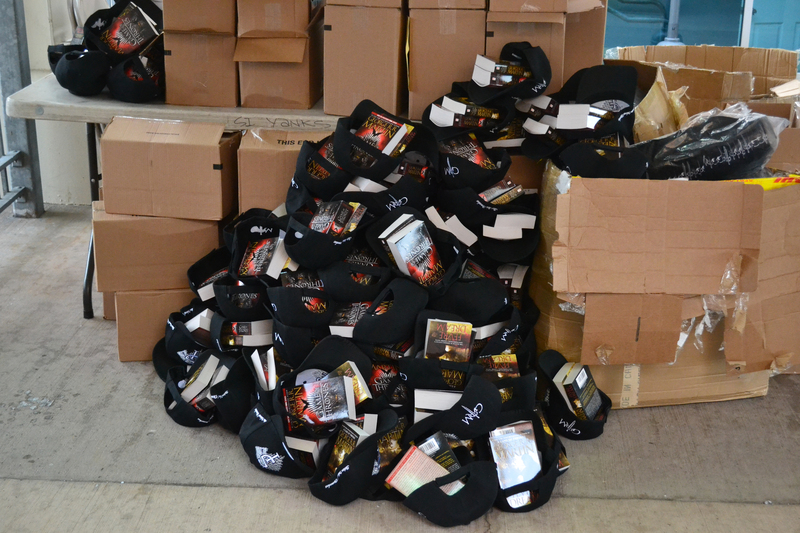 The evening began with one of the most generous fan giveaways I’ve ever seen, as the first 2500 fans through the gates received Direwolves hats as well as copies of of the original Game of Thrones book and Martin’s 1982 novel Fevre Dream. 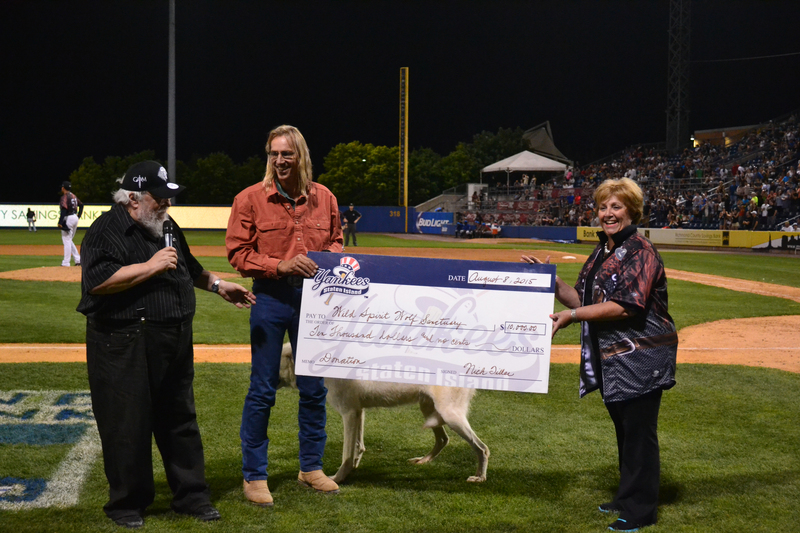 Before the game the SI Yanks Direwolves made a donation to the Wild Spirit Wolf Sanctuary, a charity chosen by Martin. 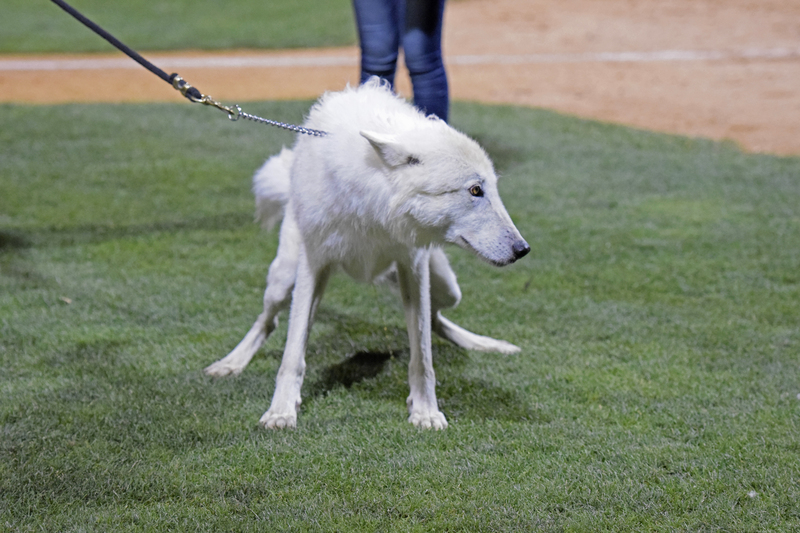 Representatives from the sanctuary brought along Flurry, an “ambassador wolf” who, yes, peed on the field! 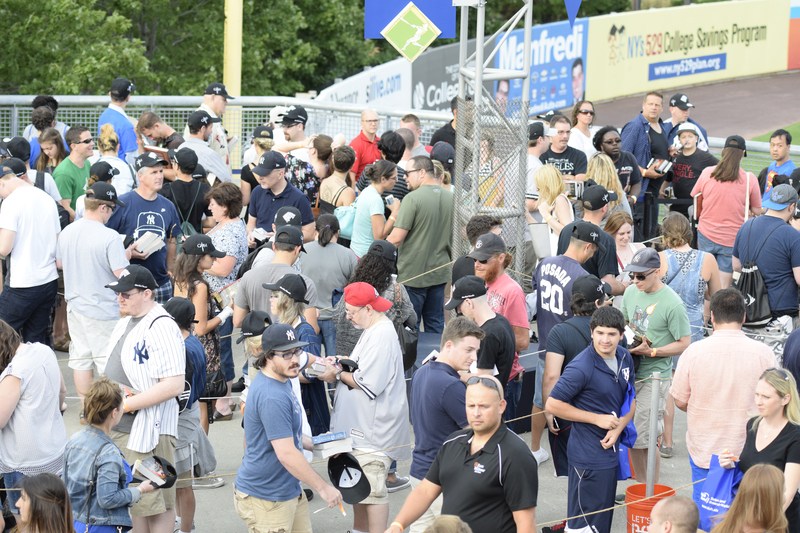 Martin also spent an hour signing autographs, which resulted in predictably long concourse lines. 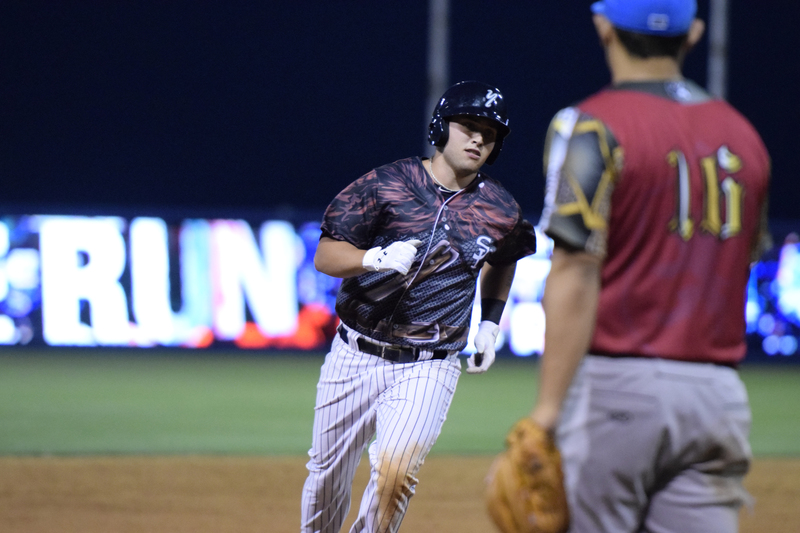 Here, Direwolf Brandon Wagner circles the bases after a home run. 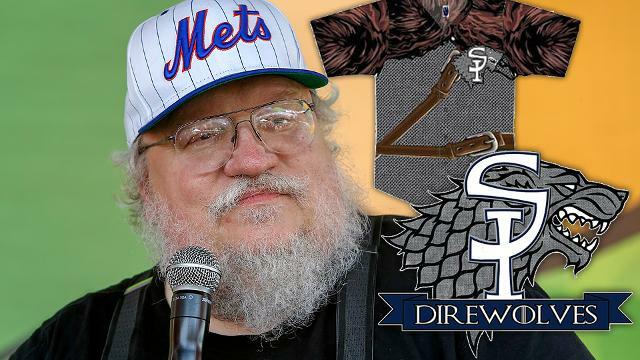 It was that kind of night for the Direwolves, who defeated House Lanister (the Hudson Valley Renegades) by a score of 10-1. Clearly, a good time was all. Everyone, that is, with the possible exception of Yankees special assistant to the general manager Hideki Matsui. He has no time for your theme night shenanigans. Okay, that’s all I’ve GOT.